We all enjoy a girl’s night, right? But what does that even mean? A girls night to the chicks means time spent with friends in a space that is comfortable and filled with love and laughter (oh, and then there is good food and drinks, too!). Some of my favorite girls’ nights have been those where we can compare notes with friends on life, marriage, motherhood and the newest reality shows! Girls nights can be as few as 2 friends or as many as 10, but no matter what, the main goal is to make it a special way to get together and have fun! There is a rotation among the chicks where we take turns having each other over — that way we all have the opportunity to get together often without the pressure of hosting all the time. This also means that we each take that opportunity to host seriously and try to find a way to make the most intimate gatherings just a little “extra” special. To help, party chicks have made planning a little easier — by making affordable and adorable party boxes. With the craze of selfies and dessert tables, everyone is looking for the Instagram-perfect picture to share with friends and family. 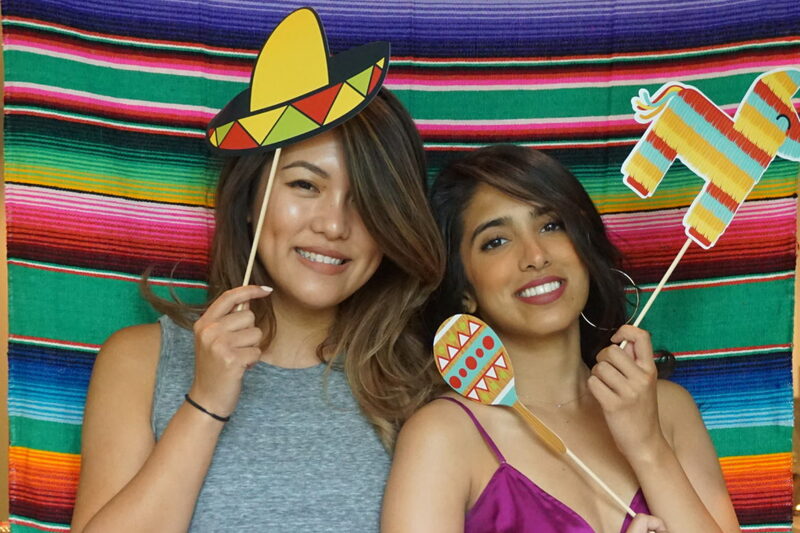 We are excited to announce our first party box themes: the Fiesta Box and the Bollywood Box! As women in our thirties we pay attention to all the details that go into hosting a girls’ night. The Party Chicks have hand picked these specialty items to make your get together a little different with everything you will need (even the command hooks!) and ten minutes. You can create the perfect atmosphere to make your friends lay back, relax, and enjoy the time you all have set aside for each other. Check out our introductory boxes in our Etsy Shop here. Scarlett Johanssen and her passé turn it up for the girl version of Hangover in Miami. This movie complete with all the classic setups for a comedy is a guaranteed girls night movie. Click image to watch the Red Band trailer on YouTube. There is nothing like getting out of town and kicking back with friends on vacation. Join Regina Hall, Jada Pinkett Smith, Queen Latifah, and Tiffany Haddish as they zip line across Bourbon Street and flash P.Diddy. As many of the chicks are moms, the concept of escaping from the kids is real! In Fun Mom Dinner, Kate Aselton and Toni Collette along with their friend turn up the fun in this hilarious comedy complete with karaoke, inappropriate flirting, and night off mom duty! Click on the image to watch the trailer on YouTube. These movies are sure to make getting out of the house with your friends worthwhile. Kid’s birthday parties: What they are … and where they’re headed. When I was growing up and that special time came around, my mom would throw a heartfelt birthday party for me in my backyard. There were hot dogs, games like pin the tail on the donkey, a homemade cake, and presents that were actually opened in front of the guests. That’s all changed. When my eldest child turned one, I celebrated by throwing her a magnificent birthday party that she would never forget (or at least I wouldn’t). The fact that her birthday lands on St. Patrick’s Day made it even more fun! I hired the local children’s Irish dance troupe to perform. A traditional corned beef and cabbage feast was served to the adults, and there was an amazing spread for the children, which, since it was all over their faces, was mostly lost on them. For the pièce de résistance, there was a huge Shamrock cake. All of our friends in the neighborhood were invited. It was a celebration to remember! Fast forward 8 years, and the days of elaborate kids birthday parties are over, for the most part, at our house. I’ve changed my ways and become more “practical”. In fact, with my friends, we have started throwing “shared” birthday parties. It all started when my husband started to realize the number of birthday parties filling our weekend. He would ask (because he’s usually clueless about our weekend plans), “What are we doing this weekend?” My reply seemed to always be, “We’re going to a birthday party.” He’d reply, “Another one? I just saw those people last week. Don’t we have any other friends? We’ve got to get a life.” You see, we have three children, and each one has around 20 kids in their class. Do the multiplication, and you’re looking at something like 60 parties per year, more than one per week every week of the year. No offense, but most of the parties were essentially the same. They were held at huge venues, gifts were collected in a box and never opened in front of the guests, and a pre-written thank you card was handed out in the goody bag as we left. Isn’t being invited to a party gift enough? And, do we have to hand out candy in a gift bag after giving the kids high fructose corn syrup fake juice (sorry), cake and ice cream to say, “Thanks for coming!” More like here’s your fattened, hyper, overtired youngster to deal with for the next two hours. He’s your problem now (thank God). I’m like thanks a lot! See you next week! Once my child even received a basketball as part of an elaborate gift bag! A really nice one too! Actually, that was a score (no pun intended) but my kids have also received gift cards. Am I the only one who thinks this is too much? My Mom wouldn’t believe the extravagance that goes on nowadays. For gifts, I either go to Amazon to buy another $40 birthday gift for a child who already has everything, or (don’t tell) I, sometimes, go to the attic where I hide away the presents my children have received that were duplicates of ones we already had, and find one to re-gift. Come on, you’ve all done it! They’re perfectly good toys! Right? Moving on . . .
One day, the other savvy chick and I were discussing birthday party ideas for our soon-to-be 5 year old boys. We analyzed all the possibilities and dates to have these parties when, at the same time, a light bulb went off in our heads! Not the adult kind some parents need after one of these triple birthday party weekends, but one that celebrates our sons birthdays together! Since our sons were born only 4 days apart, it made total sense! We figured we were saving the rest of the class the rigmarole of another weekend dominated by another lame kid’s birthday party (the party, not the kid)! On average, I shell out around $500 for each child each year. The first birthday parties were more. Hmmm……3 kids X $500 = $1,500 per year on birthday parties! Now let’s really get into tricky math and base this on 8 years of birthday celebrations! $1,500 X 8 = $12,000. Now that’s some serious cake! Before you start thinking, “Oh, I get it, they spend half the amount and receive 100% of the gifts!” WRONG. We make it clear on the invitations, “No Gifts Please”! We find most people adhere to that request. Sometimes parents aren’t sure if the people they invite will come. They don’t want their child to be hurt and embarrassed so they decide not to throw a party at all. By including all the moms in the class in this planning, every kid will have a birthday and no one will feel left out. 1) Cost savings! You can spend half the amount! Or share with a couple of people in the class and save 2/3rds on your birthday budget! 2) You get your time back on the weekends! 4) Every kid gets a birthday party. 5) The best benefit of all is the relationships you form while planning the parties. You make friends and get to know the parents and kids better! 6) Finally, less sugar….less sugar….less sugar….. If you are a mom like me that watches your children’s sugar intake, you have just reduced the amount of cake and harmful food dyes they are going to consume this year. The idea has caught on…….. These 2 savvy chicks were thrilled with the success of their idea. And this might shock you. Neither child complained or felt cheated! My son loved his party! So much so that we are having it again this year with 4 other kids who’s birthdays are also in the Spring; including our brainy chick’s son! My son actually shares the same birthday with a boy in his class. (May the 4th be with you!) Now two other moms with children in that class are hosting a shared birthday next month! Don’t forget that each child still gets their own family party. That’s important. It’s when our kids can open presents and get attention from those closest to them. We haven’t done this every year for every child. Some years we still want to throw a party just for our little darling. Other times we allow our child to have a party that brings only a few friends together for a special experience, either because it’s an expensive activity, a long drive away, or it’s an all-day experience. Those are great and memorable too. 1) In order for this to work well, you need to include all the moms who’s children have birthdays the same time of the year. Depending on the class size, maybe 3-5 shared parties a year. Inclusion is the key. Offer it up so everyone has the opportunity to participate if he/she would like. 2) Be flexible! Work with the group of women on finding the venue, time and date. 3) Divide up the responsibilities! You need one person to “coordinate” the master list and start assigning responsibilities! This is best handled by the “spreadsheet” mom. You know who I’m talking about! 4) Make sure each child’s name gets into the Happy Birthday song. It’s funnier the more kids you have sharing a birthday.